Despite nods in the direction of such worthy endeavors as Attack the Block and District 9, Captive State (** out of four) is basically a World War II picture reconfigured for a sci-fi crowd, with outer space invaders cast as the Nazis and humans repping the two sides of the French flip: resistance fighters and collaborators. Indeed, while the word “Vichy” never comes up, “collaborators” is rightfully applied to those people who dutifully serve the extra-terrestrials rather than fight them. As for the aliens, the collaborators call them “legislators” while the dissidents call them “roaches,” even if their physical appearance more resembles a sea urchin, or a porcupine, or John Travolta’s pre-combed hair in the animated sequence that opens Grease. Captive State begins with so much scrolling text that audiences will be forgiven for thinking they’re back on their couches at home cracking open a hardcover book. Once these viewers are transported back to the multiplex, they’re introduced to seemingly more characters than was found in the entire 57 seasons of the TV soap opera Guiding Light. Chief among these is William Mulligan (John Goodman), a Chicago cop tasked with tracking down dissidents; Gabriel Drummond (Ashton Sanders, the teenage Chiron in Moonlight), a young man who repeatedly finds himself in the middle of sticky situations; Gabriel’s older brother Rafe (Jonathan Majors), a key figure in the resistance movement; and Jane Doe (Vera Farmiga), a prostitute with a portrait of a Trojan horse in her living room. That painting is actually more of a spoiler than writer-director Rupert Wyatt probably intended, since its presence points toward the twist that will pop out of the cake in the last act (it also doesn’t help that a likable performer has been cast in a significant “heavy” role, thereby also spoiling the surprise). But Captive State has problems from start to finish. Its only true narrative innovation is that the aliens have dismantled all cutting-edge technology on the order of computers and cell phones, requiring humans to again rely on landlines and (woo-hoo!) print newspapers. Otherwise, everything else about the film suffers from its murky presentation, particularly in terms of threadbare characterizations as well as a fussy and disjointed plotline. While everything does come together by the end, it scarcely matters since the picture’s pacing is draggy and the players reduced to rigid chess pieces. “Take Back The Planet” blared the tagline for Battlefield Earth, another film about enslaved humans combatting nefarious alien invaders. 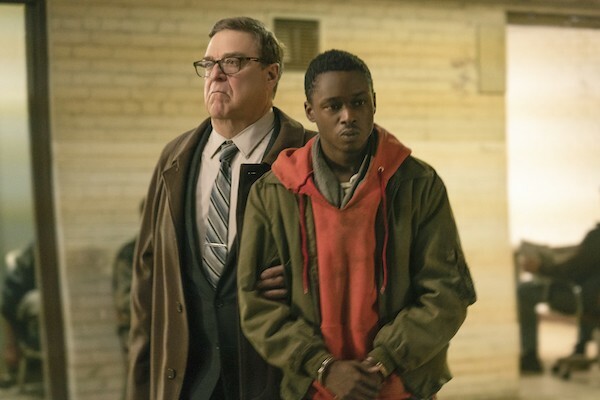 Captive State certainly isn’t awful like that ill-advised atrocity, but neither is it likely to inspire anyone to hoist the pitchfork and join the good fight.